I have always wanted to sit with someone who had survived the horrors of the Holocaust, and here was Robert Knapp seated right before us at our dining table, giving us a firsthand account of what it was like to be an eight-year-old boy in 1944 in Auschwitz. I had a very memorable dinner a few nights ago. 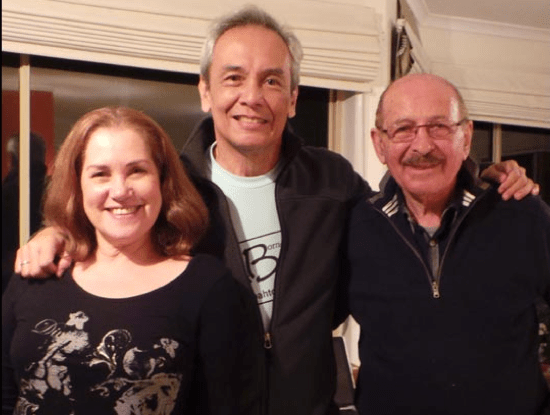 Lydia and I invited Inez Morato, Lydia’s classmate and long-time friend, her Aussie husband Robert Knapp, Inez’s brother Martin and his wife Sheila last Sunday for merienda and dinner at our house here in Glenwood, NSW, Australia. Inez and Robert had just gotten married and we thought it would be wonderful to meet her new husband, Robert, and the rest of Inez’s family who are in Sydney. It turned out to be a night to remember for all of us. It was an evening of meeting great new friends. But mainly, the night would be unforgettable because of Robert. Except for Inez, our three other guests, Robert, Martin and Sheila were strangers to Lydia and I. In between cheese, figs, sausages and wine, we all casually introduced ourselves to each other. After we talked about what we did for a living, and bits about our backgrounds and a few other personal trivia, Robert casually and voluntarily dropped a bombshell and said, “I have something interesting to share. I’m an Auschwitz survivor.” Before we could react, he continued that he and his family were survivors of the infamous Auschwitz concentration camps during World War II. Except for Inez who already knew about it, we were all stunned. I was speechless for a few seconds. I had read so many accounts about the lives of Jews during the war and the Holocaust. I had seen so many movies about it, too. I have often wondered how something as horrible, inhuman and monstrous such as the Holocaust could be perpetrated by a civilization like Germany that was also capable of producing great humanist philosophers and thinkers. Didn’t Germany also gift the world with great art through the centuries? I have always wanted to sit with someone who had survived the horrors of the Holocaust, and here was Robert seated right before us at our dining table, giving us a firsthand account of what it was like to be an eight-year-old boy in 1944 in Auschwitz. He remembered how his family, together with so many other Jews in Hungary, were picked out of their community and packed like cattle in trains and sent to concentration camps. He recalled that after getting off the train from a long ride, hundreds of them lined up and walked towards a Nazi officer seated on a velvet chair who directed some of them to go to the right and the others to go to the left. As it turned out, it was his way of segregating who would live as slaves in the camp and who were to die immediately in the gas chambers. That was the last time they saw the old, the weak, and the sick. He was sent to barracks that had about 500 people. Kids and adults were mixed together. He shared a double-deck bed with nine people. His parents and family were housed in another area at the camp. During their stay there, they experienced a biting winter. They were without blankets, beddings, towels. It was unimaginable how they were able to withstand the cold. Perhaps sleeping in crowded quarters helped them. There was hardly any food and whatever was given to them had to be shared. The prisoners also had only one pair of clothes and it was all they wore throughout their incarceration. Since it was winter, he said that they did not wash their clothes because they would have nothing to wear if they did. Amidst all the hardship, he recalled one prisoner who made life bearable for all of them: Victor Frankl, the author of the monumental bestseller, Man’s Search For Meaning, was a man the eight-year-old Robert would not forget. I read Frankl’s book many years ago and it is one book I will remember for life. Robert recalled that Victor would throw “dinner banquets” in the barracks by enticing everyone to use their imagination and pretend that they were having a feast while eating their very meager food. He was a very likeable man, to say the least, and a beacon of hope because he lifted everyone’s spirits. It wasn’t unusual that people died in their beds during the cold winter nights. Nobody got adequate nutrition or medical care. Everyone was malnourished, thin, most sickly after a few months of inadequate diet and medicines while being worked to the bone. While his parents and brother were in the camp, he was separated from them. None of them saw one another there. As he told his story, I noticed how he could describe everything quite dispassionately. Perhaps it is because many years had passed. I tried to imagine how an eight-year-old boy could have coped with the horrors of it all. What it must have taken for anyone to recover from the hell that was Auschwitz — if they could even fully recover — is a testament to the strength of human will and man’s indomitable spirit. Frankl, in his book, mentioned that while he was inside the camp, he could predict who among the prisoners would survive and who would die. He concluded that all those who had something to look forward to would possibly survive and all those who had lost hope would give up and die. He was mainly right. A particularly poignant example of this, Robert recalls, was when the whole camp came alive with rumors that the Americans would liberate them by Feb. 6, 1945. It raised everyone’s hopes. When the date came and went without the Americans coming and liberating them, many of the prisoners died overnight because they were brokenhearted and had lost all hope of being saved. It took another two weeks before they were finally liberated. It was the Russians who rescued them. When they were at last freed from the camps, Robert and his brother somehow found each other. They then went to Vienna via a farm truck that carried cattle. In front of the truck was a horse carriage that traveled ahead to make sure the truck would be safe from land mines. They paid their way with jewelry that their mother had given them before they boarded the train to the camps. From Vienna, they took a train back to their village in Hungary. When they reached home, they were filled with joy upon seeing the rest of the family complete and present. It was an ecstatic moment that Robert would never forget. He wore a big smile as he told that portion of the story. They were all alive, thank God, even if his father was now wearing a glass eye. He had been shot in the left eye while in the camp. But, at least they were all together. A few years later, his brother escaped from Hungary when the Communists took over. He migrated to Australia. Robert and the rest of the family followed soon after. When I asked Robert how he felt about the German people, he said, “Nothing. I have no ill feelings. I can’t blame them as a people. They had a stupid leader.” I was quite impressed by how he did not seem to carry any hatred for what had transpired. Instead, he seems to take pride at how amazing his life has been. He did not reconnect with the Hungarian community here, not even with his Jewish roots or heritage. He simply moved on from most of the things that were part of his horrible past. Curiously, Robert has a great sense of humor. He eyes twinkle when he delivers a punch line. I found it quite beautiful how his spirit has not been diminished or snuffed out by the hatred and cynicism that he has experienced. In place of that, I saw a gentleness, an inner peace, a healing radiance as he gazed lovingly at his wife Inez. I generally like modernity. I am comfortable with change. I can easily adapt to new situations. I am excited about breakthroughs in technology, philosophy, education and thinking in general. I have a curious mind. I like it that I am tech-savvy. But please note that I qualified the previous paragraph with the use of the word “generally.” Looking back, there were a lot of good things that we enjoyed last century that I wish were still the norm or practice today. Today’s article will be some kind of a nostalgia piece about what I miss from the recent past and things I wish we did not have to live with in today’s modern world. Before we totally forget what the world was like not too long ago, here are a few old things I still pine for. 1) I wish we did not always have cellphones, tablets or so much of the portable stuff we bring around today to connect to the world. Okay, if it’s an impossible idea, maybe on some days, we should opt to leave them home just like the color-coding we do with cars. It was so much simpler before we had them. We went about our immediate, relevant business and concerns without them and seemingly without problems. When you looked around you, you saw people looking at the world and/or other people. If they were trying to avoid looking at you they would be looking straight ahead or somewhere else. Now everyone is just looking at their gadgets. Haven’t you noticed? These days, where people are seated or waiting, you see most of them now with heads bowed engaged in browsing sites, reading, texting, tweeting, doing Facebook or shutting themselves out of their immediate surroundings. Isn’t it ironic that many are more connected to social media today than with our immediate, real “here and now” physical situation? We prefer to be engaged with something or someone geographically distant from us through our phones and tabs than those who are right here in front or beside us! Everyone is living in a cocoon within their own gadget world often firewalled from their immediate locations and concerns. I fear that, more and more, we may be losing the art and joy of person-to-person interaction, or the sane practice of just being totally present to the here and now. 2) I wish music videos never became a big part of the music industry the way they have become now. I say this at the risk of sounding like an old man, which to many quarters I know I am already considered to be. In the “old” days before music videos, there was so much emotional and imaginative involvement that musicians, singers and performers enjoyed with listeners. People were left to actually imagine their own visuals solely inspired by the sheer power of the song itself. Both artists and songs had to be really good to make their mark with the audience. These days, everything is served to the listener on a platter. Artists practically force-feed the audience with their own interpretation of their songs depriving people the use of their own imagination. There is hardly any real involvement left from the audience except to become fans. So much of the old interaction has been corrupted or stopped. And one of the worse things about this setup is, a bad song often is transformed into a good, even “great” one because the video was exciting. And the opposite happens as well to a good song with a bad video. No wonder there are so few good songwriters today, but so many good videographers. And even less great artists/performers who can make a lasting career without videos. 3) I wish that all this knowledge available online was not as readily accessible to everyone as it is now. One may argue that their availability is the best thing that has happened to research, and it is true. I have to agree. But this availability has also led to the printed page going the way of becoming obsolete. All over the world, bookstores are closing shop. And worst of all, despite the Internet, people are actually reading less! A world without books and bookstores is too sad to imagine. And what kind of people will we have in the world if they do not read some of the world’s greatest writings and the classics? 4) The availability of digital cameras to everyone, especially Photoshop in my opinion, has not been good for photography overall. Don’t get me wrong. I love all these digital apps and gadgets but I feel that just like music videos, they can make bad photos look too good and all too easily as well. I cut my teeth in photography by actually learning to shoot with film more than two decades ago. There was/is nothing like film. As photographers then, we knew that every time we pressed the shutter, it cost us money. And there was no instant viewing of pics then. We had to have the film developed first and then printed to see if we shot a good one. We therefore had to be more careful, perceptive and knowledgeable about composition, lighting, and all other aspects of photography. Now, a lot of people take photos on auto mode without even looking through a camera lens and hope they get the right pic through sheer volume of shots, and then fix the photo with an app. Where is the challenge in that? 5) I wish kids could grow up today without malls and could enjoy the outdoors more. It is a sad state of affairs when kids do not run or play enough under the sun or rain, or when they look at the outdoors as a dangerous place where you can catch all kinds of sicknesses. I grew up spending a lot of time doing scouting, camping at the beach and in forests under all-weather conditions. I was fascinated by nature. I lived without air conditioning as a child, and I still use it sparingly as an adult. Today, the task of humanity is to save the environment. But how can kids be inspired to do it if a lot of them are growing up hardly exposed, much less enthralled or fascinated, by nature or the outdoors? It will take a lot of physical actions and initiatives to restore this planet to something more sustainable. 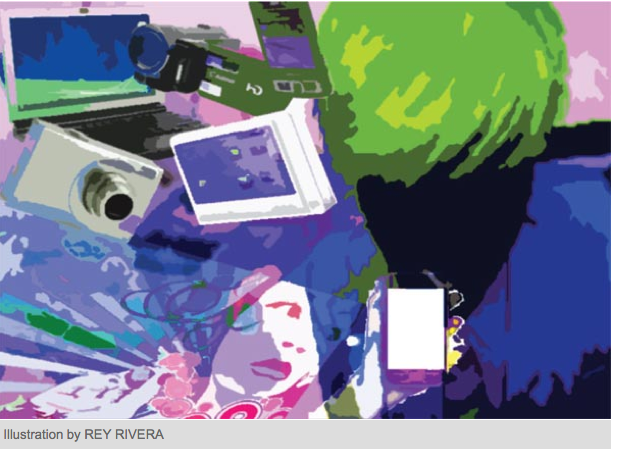 Don’t rely on an app on your gadget to save the environment. I also regard with seriousness and concern the observation that many kids now hardly make or entertain themselves with homemade toys. Instead they enjoy expensive gadgets and readymade toys given by their parents who probably feel guilty because they spend less and less time with them. I wouldn’t mind bringing back some of the simple ways of the past, even if inconvenience is the price to pay for them. There is nothing that is still. Nothing is static. Everything is moving, changing, evolving into something new. Some change quickly. Others change slowly. Each has its own speed or vibration. And even when things seem like they are perennially frozen in time, they are actually going through a metamorphosis, albeit too slowly for us to realize. But trust that it is happening. That is the way of life and the world. I once saw a video on the Internet that showed a new born baby sleeping. To the naked eye, it may seem like nothing much was going on. That’s how it appeared when it was shot with a regular video camera. But when it was filmed with a super high speed camera it caught the many previously unnoticed movements he was making. Parts of his body were practically pulsating here and there non-stop together with the beating of his heart. One can say that the irony of it all is that you only notice the aliveness of everything and the direction things are taking when you are in a state of stillness and awareness. It is only when you take stock by pausing, detaching and stepping back do you see what is really happening. I have seen fortunes change quickly. I have also seen it change slowly. Money not only changes hands but it also grows and gets depleted. Friends have come and gone. And new ones are always made. Loved ones were once there. Some have died. Others have moved away. Some have moved on. My own youth once seemingly endless and eternal has frittered away with the passage of time. Some people get surprised when they see me in person and tell me how much I have physically aged. These are people who used to see me daily on TV. Little do they realize that more than a decade has passed since I was visible everyday on their TV sets. They did not see changes happening incrementally. And much less do they probably realize that they too have aged just as much. It is tempting to romanticize and imagine that there are things that last forever. But do they really? I ask this rhetorically, because the truth is, I am not sure. People form partnerships. These are deals or agreements made where they promise to invest their energies, emotions, love together in pursuit of happiness in a future that is full of beneficial potentialities. In short, these agreements are investments with forever in mind even if the future may or may not deliver. It is always an open future. Things can go either way even if they are hopeful things will work out for well. But even so, people do this for many reasons that they imagine are mostly beneficial. One of them is, at least they don’t have to live life alone in the world. But once loyal friends can and do part ways and may even turn into enemies. Lovers can go their separate lives even after promises are solemnly made before God and friends. Bonds, explicit or unspoken are made and often broken. This I have seen and experienced many times. People disappoint. Fate plays cruel tricks. I know women who have awakened to the shock of discovering that their husbands were not the knights in shining armor they thought they were. I have also heard husbands complain that their once sweet, loving, beautiful wives have changed into monsters. I knew of a young couple many years ago who were so much in love and got married only to discover a few years into their blissful union that one of them was sick with a fatal disease and would not live long. The wife died of cancer after just four years. Commitments, relationships and promises may last and endure until death. It doesn’t always turn out that way but some do. But I think they only do so when the parties involved are awake enough to recognize the dynamic nature of the people they invest into forever with. With eyes wide open, we enter the gates that lead to forever but with every few steps, the road conditions may change. One moment it is a smooth, easy path pleasant to traverse. Suddenly it can get very rough with hardly a path to walk on. It is easy and even understandable at times to turn around and just abandon the journey. It may even be the wise thing if the path ends on a cliff and continuing to go on may mean great physical injury or even death. But the wisest advise may be this: before you make your commitments, consider the worst possibilities. If you think that in the end, you will gain more in terms of personal growth and that it is worth all trouble, then go and do so. I mentioned long ago that I read article in Psychology Today that says all types of relationships go through the perennial cycle of promise, disappointment or betrayal and courtship. It is similar to what is described in zen as great faith, great doubt, great vow and great effort. St. John of the Cross says something similar. You attempt, you fail and rise to repeat the cycle again and again. It may sound senseless and cynical to some and may justify why things don’t work but to me it seems like a reasonable explanation why things can work despite the disappointments. Through every cycle of it, if we keep our eyes open there can be qualitative changes on how we experience the stages. This may indeed be the cycle of things but the level of the experience of it may be higher each time. There are always lessons and realizations to be learned which include taming and adjusting expectations, keeping fears and negativity away and refining and improving efforts at what we do. Sensei Sevan Ross, director of the Chicago Zen Center said, “If we have no doubt, we have no faith. If we have no faith, we have no doubt.” The doubt comes with the faith. The faith here is not about certainty, nor is the doubt here about denial. True faith and doubt will always go hand in hand. You will always feel free but you must continue anyway. Both are about committing to the continuation of life’s unknown journey but through a progressively higher level of experience. People who buy into “forever” are not necessarily fools who are marching off to a cliff of disappointment and cynicism. “Sell your cleverness and buy bewilderment. Take one leap after another in the darkness until the light shines,” is a zen saying. With eyes open and with awareness, the continuous jumping into the unknown may be better guided each times as we learn and grow. 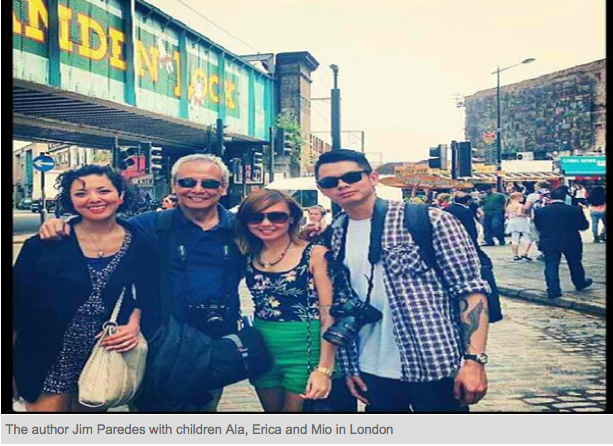 The author Jim Paredes with children Erica, Ala and Mio in London. I just love being with family especially while abroad. We’ve had family travels before. We’ve been to Australia, Cambodia, US, Davao, Baguio, Boracay and a few other places. Last week we had one that was unexpected and unplanned. Except for Lydia who was in Sydney, I met up with the rest of my family in London last week. My three kids Erica, Ala and Mio had finally decided to take a much-delayed European travel given to them by a generous uncle and aunt as graduation gifts years ago. They all took off from work and decided to leave for London from where they would start their European adventure. As luck would have it, I was going to be in London at the same time they were to attend the Samsung Premier 2013 launch of new products. The moment I landed at Heathrow Airport in London, I contacted my daughter Erica. We immediately planned lunch since I had limited time to be with them. I was in London for work after all and I was just taking advantage of whatever free time I could get. So with hardly any sleep from that long ride from NAIA 2 to Heathrow, I took Bus 27 from Kensington High where my hotel was to Camden Market, which was close to an hour’s ride. I got off the bus after about 25 stops. After a block’s walk, I met up with Erica, Ala, their friends Trina Epilepsia and Issa Perez Tagle who were also traveling around Europe and shared a flat with them. My son Mio who was taking some photos around the block appeared a few minutes later. In previous family travels, we usually went to places where none of us really knew how to get around. We liked to rely on maps, guides and friends. I remember how young they were then. As a parent, I was always watchful of where they went and what they did. But my kids are grownup now. And this was London, Erica’s favorite city. She had spent a few months here some years back to study a course on makeup. She knew the nooks and crannies so well, the places to visit and avoid like the back of her hand, that I had to ask her half-seriously if she actually did study during the time she was here, or did she spend all the time gallivanting and just having a great time? Hmm. Camden is quite an interesting place. It is edgy and daring. You see a lot of very young, very bold fashion clothes and accessories for sale, and a cornucopia of post–hippie cool stuff. T-shirts, beads, rings, bracelets — things you would see in tiangges, flea markets, etc. You see lots of hand and homemade stuff everywhere but the difference is they are very hip. The natives are either very casually attired or dressed to make a statement. Fashionistas in elaborate punk get-ups are a common sight. It is a photographer’s paradise. After some shopping, we went into one of the side streets for lunch at a Latin-Carribean inspired restaurant called Guanabana. It is owned by a friend Erica had known way back named Omar Khan. He served a fusion menu ranging from adobo sandwich to lamb, to ribs. He served us a yummy refreshing mojito concoction but without alcohol. Everything was actually very delicious. After the meal, we went back to shopping again. But I soon had to beg off since jetlag was taking its toll on me. I went back to the hotel around mid-afternoon to get some rest. I found more free time the next day and so we all met again this time at Borrough’s Market. I took the train, or the tube as Londoners call it to get there. I had my fear of getting lost since I knew I had to change trains midway but it all went well without a hitch. Borrough’s Market is a covered area with lots of stalls and open stores selling all sorts of cheeses, wines, meats, chocolates, pasta, fruits, pastries, candies and a host of other things. I had a pork belly sandwich which I highly recommend if you are ever there. It was tasty, scrumptious and filling — a full meal. We went around a bit more but after about two hours, we bid our goodbyes since each one wanted to go to a different site to visit. It would be the last time I would see them in the next two months. Travel can be quite stressful. Thank God it was too early for that since they were just at the start of their six-week journey. All throughout my time with them, I felt a sense of fatherly pride as I watched how decent, independent and fun-loving my children had grown up to be. I noticed how intelligent, perceptive and appreciative they were of everything they saw. And the way they soak it all in and even go native and local is admirable! No doubt, they are cosmopolitan travelers. And best of all, they are people who know how to comport and conduct themselves properly in almost any locale or setting. I wished Lydia had been there to enjoy their company and to just watch how our kids had turned out. I especially enjoyed the few one-on-one moments with them. While walking, Ala put her arm around my waist as we walked and expressed how she had missed me. I loved that. I missed her, too. Mio and I had our male-bonding moment when we casually talked about the pretty girls we saw on the streets. We also talked about where he was at the moment in his life and some turning points he was going through. With Erica, I felt she was taking the ate role quite seriously and made extra sure her sibs were on schedule and coordinated. She also took care that her papa would not get lost in London or be uncomfortable while with them. Family travel is wonderful. And I am lucky that my family has the same penchant for it as I have. We all like saying yes to unknown places, appreciating strange accents and being open to new experiences. There is an openness one must have for travel to work its magic. One must be ready to take both an outward and inward journey. There is as much to learn about oneself as well as other people. The whole idea is to immerse oneself into a bigger reality and greater sense of what humanity is all about. Otherwise, travel anywhere becomes just another reason to feel superior or inferior vis-à-vis another culture. Travel is expensive, no doubt about that. But if it gets you bonded closely as a family while being educated about the world, people, cultures, traditions and a host of other things one can only learn through actual travel, it is worth the price.